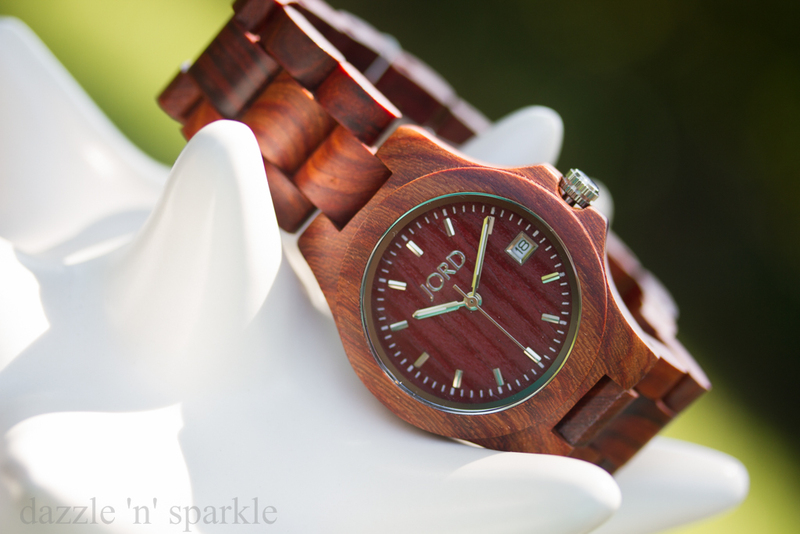 Wooden wrist watch! Ever heard of anything like these? 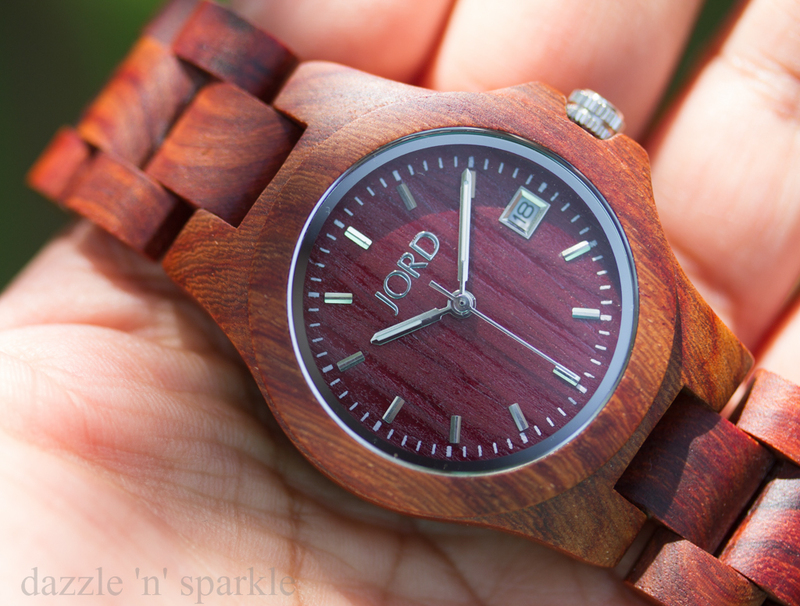 Not me at least, until I was approached by JORD Watches, a company that makes wood watches. I had never seen anyone wearing a wooden watch nor in any of the stores or in any print ads. Even my husband was intrigued. 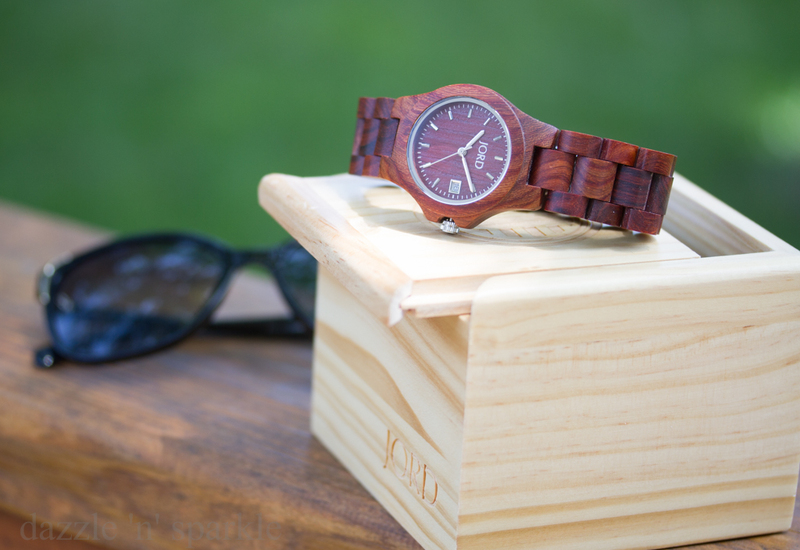 Both he and me were curious to see what exactly a wood watch would be like. We both love to wear watches and even though many times I use my iPhone to check the time, my wrist always has a watch. I treat watches like a piece of jewelry. An accessory that I find easy to wear and pair. While browsing through the website, I liked the CORA SERIES Zebrawood & Turquoise model the most, especially because it had the most unique aqua blue dial and Gold rim/hardware. It looked perfect for summer! I think I will eventually end up buying this myself. I am so in love with it. I was offered to choose from 5 models that I believe the company has planned for their promotional purposes. I chose the Ely model, because it had the smallest dial and I thought it would be perfect for my short frame and wrist. The difficult part was choosing the color. These come in four different colors. Cherry, Black, Maple, Natural Green and Maple. 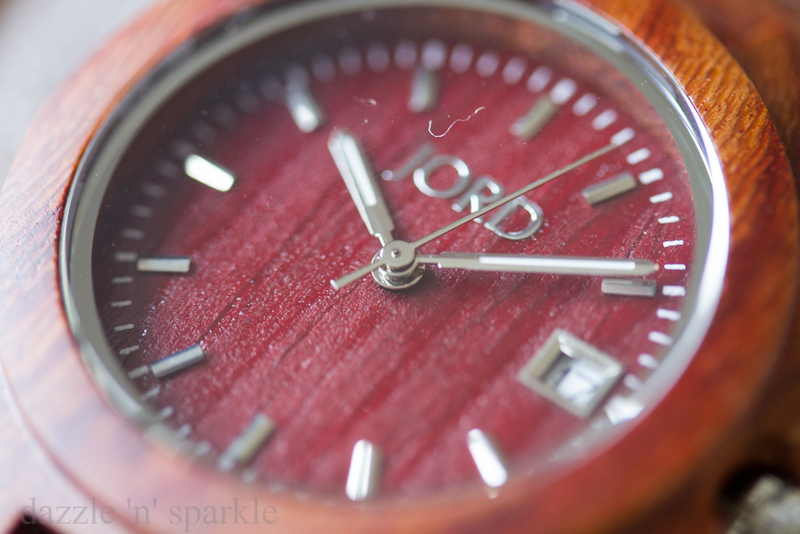 Each and every watch would look slightly different from each other due to the wood grain. Every single piece would be unique in its own way. Cherry was the color I chose. I was torn between Black and Cherry. I thought Black would be too black and the whole wood finish would get lost. But I was so wrong about the black one. I saw that one on other blogs and it looked stunning!! Cherry is a beautiful shade of maroon. It is neither too red nor too brown. Just perfect! 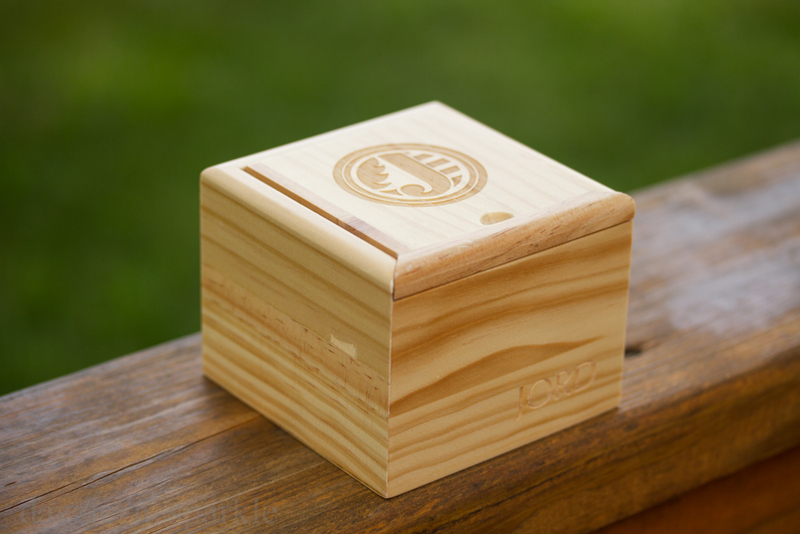 The watch itself arrived in a wooden box, that went well with the whole wooden theme. The first thing that I noticed was how light the watch weighed. It was feather light. Well not exactly feather light but very very light. It looked sturdy and well made. There were no sharp edges and curves were smooth. The inside of the dial has same shade as the whole body. There is a date display. 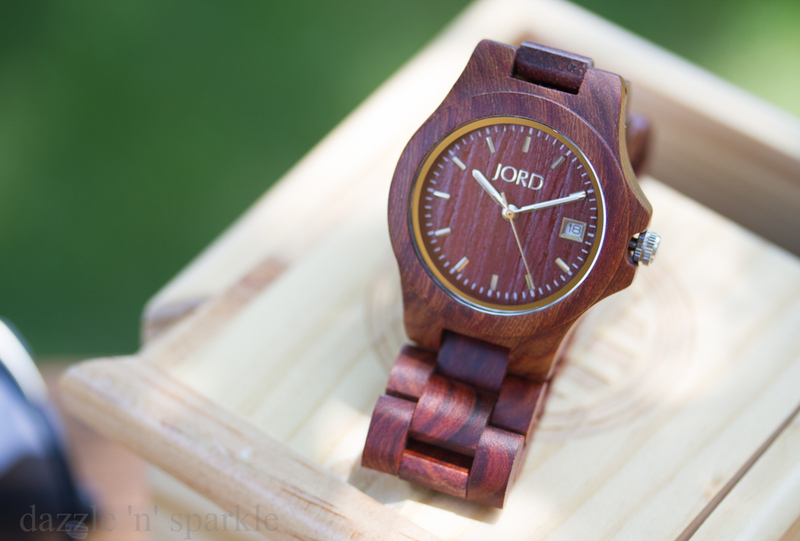 The back of the watch is made of wood too and it would work excellent for anyone who is allergic to metal. The simplicity lies in this dial and the band. 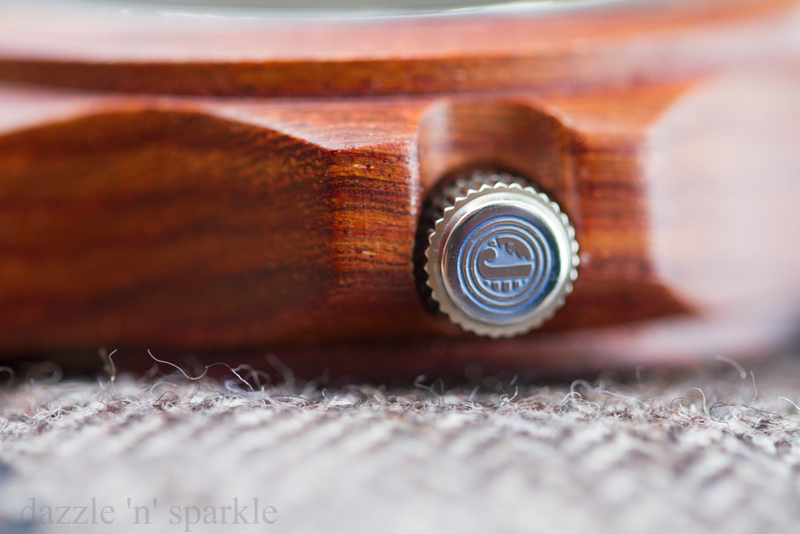 The little steel knob or the side key has J engraved on it. The watch is simple to open and snaps shut with one hand (Deployment Buckle with Push Button is the technical term) There are no complicated hidden tiny clasps that are notoriously famous for ruining manicures. 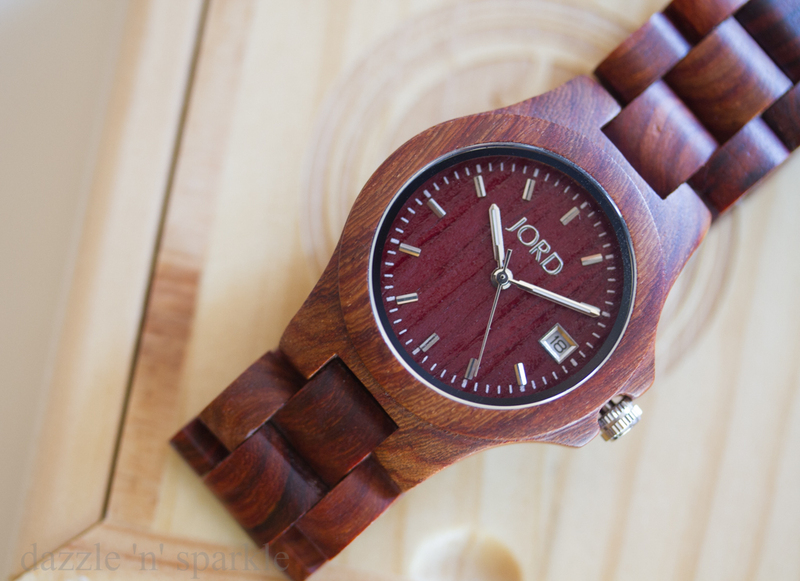 The watch band is wooden too and it looks beautiful. Many people love to wear watch with dial facing on the inner side of wrist. 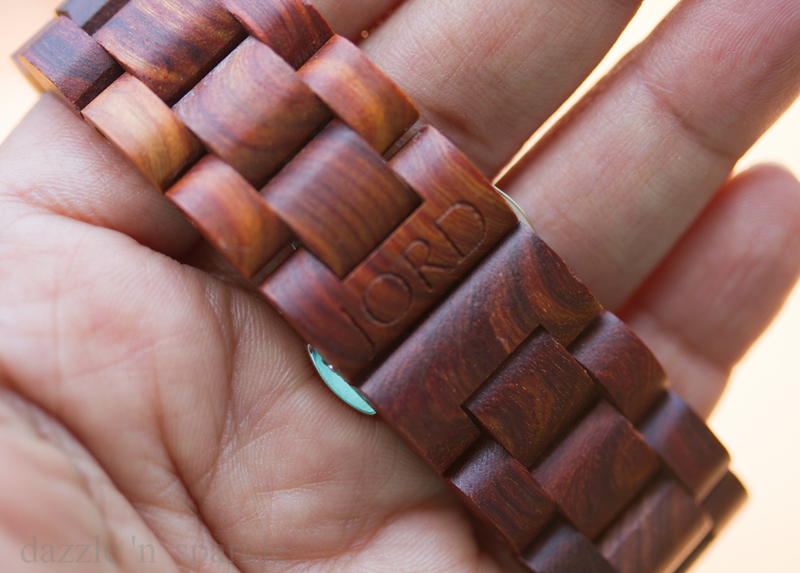 The band is so well made and aligned that it mimics a wooden bracelet. I went a little crazy with pictures. Now I am no Lifestyle blogger so clicking pictures of the watch showing them in action was the most difficult but fun little project that I enjoyed a lot. I love to layer bracelets with my watch. It is always fun to mix colors and textures. 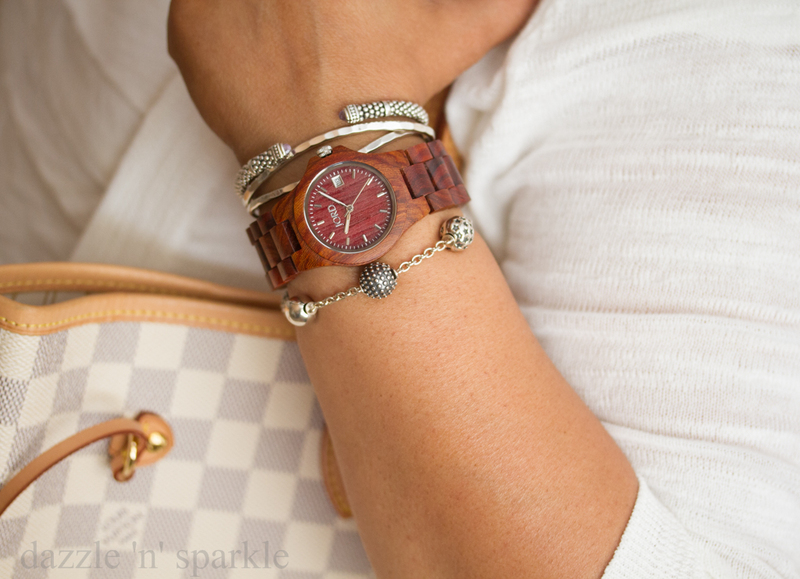 Mixing metals, woods, beads just adds this little ‘something' to the whole look. 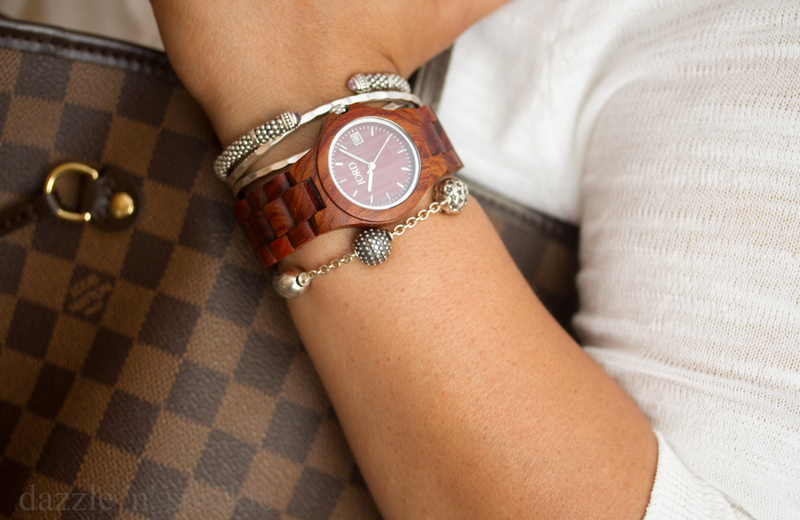 For this watch in particular I enjoyed layering silver jewelry. Pandora Beaded bracelet along with Lagos and David Smallcombe hammered cuffs went pretty well. 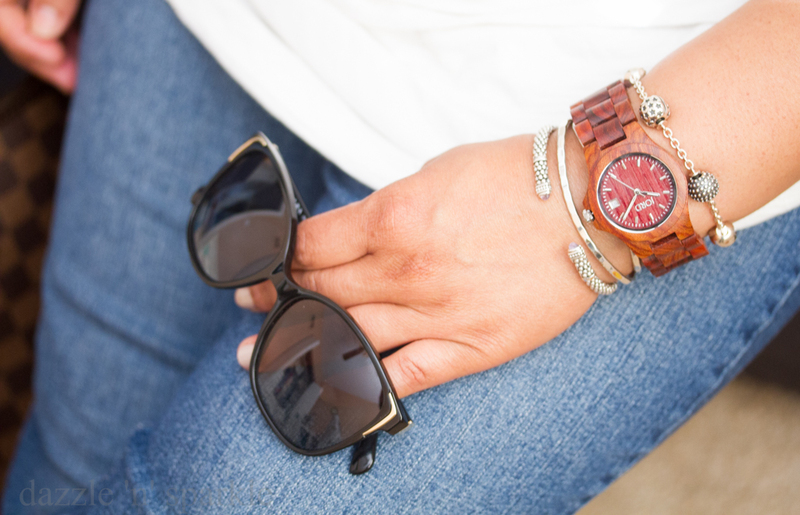 The chunky watch looked sporty and chic at the same time. No, I didn’t carry two bags on same day. I purposely showed two bags with drastically different shades, just to give an idea how the watch would look in general. I did try to model like fashion bloggers, but that was an epic fail! So for now, I would stick to close up shots. Most of the current designs that the brand has on their website has steel or silver shade hardware. I do wish to see more watches with gold rim/hardware in this size from the brand. A beautiful piece of accessory to have. It is more prettier in person than in the pictures I think it is worth owning one for its uniqueness. It would make a great conversation starter. It would add to any collection and makes a great gift. 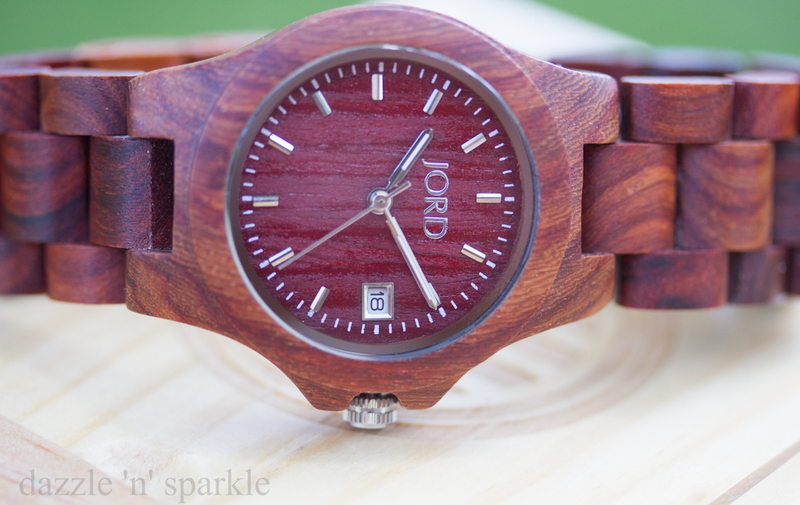 Very thankful to the JORD company to give me a chance to own and review one of their wonderful pieces. Disclaimer: The watch was send for consideration. All opinions as always are mine. This is not a paid post.